I received Lover Enraptured in exchange for a fair and honest review. I first fell in love with Jodi’s snarkiness with her That Old Black Magic series. It’s full of magic (obviously) along with shifters, witches and more. Since then I’ve been treated to more shifters in Cat Scratch Fever, futuristic mayhem in the Midnight Justice series and even a couple of contemporaries thrown into the mix. Granted, that’s quite a variety. A few things that you can count on when you pick up a Jodi Redford book though is that there will be heat… (lots and lots of smexy heat) and characters that you have no choice but to fall in love with. Not surprisingly, Lover Enraptured was no exception.Readers were introduced to Avily and Jerrick in Lover Enslaved. We knew then that there was a connection between the characters but in Lover Enraptured we found out exactly how strong it was. Jerrick was determined to protect Avily at all costs from everything, including himself and the danger that surrounded him. Avily was just as determined to prove to Jerrick that they were destined to be together. He didn’t think he was good enough for her and she was determined to prove him wrong. That combination kept things interesting to say the least. Throw into the mix a jealous ex-girlfriend, a geeky unwanted side-kick, a fair amount of heartbreak, some really, really bad guys and a few other questionable characters and you have no choice but to keep turning pages to see what will happen next. And, trust me, a lot happens.Basically, Lover Enraptured had everything I’ve grown to expect (not to mention look forward to) in a Jodi Redford novel and more. There were even a few twists and turns and more than one moment where a character totally surprised me. I love it when that happens. As usual though, pay close attention to the warning. It’s not there just to make you blush and giggle… well, yeah, knowing Jodi it probably is there to make you blush and giggle, but it’s also a legitimate warning. Snarkiness is rampant, the characters are lovable and there’s plenty of unabashed smexiness to go around. Enjoy! I might end up giving this one a 3 1/2... once I wrap my head around the ending... Yikes! 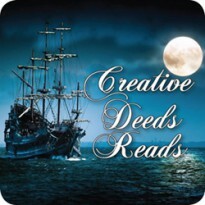 I received The Dream Thieves in exchange for a fair and honest review. Definitely 4 1/2 Stars... but not quite 5....This book needs to come with a disclaimer. Nothing major, just a simple warning explaining that if it’s been a year since you’ve read The Raven Boys, you need to pick it up again before you read The Dream Thieves. Honestly, you can thank me later. Maggie Stiefvater packs a lot into these 448 pages and not a one is wasted on back story. Well, maybe a little, but not enough to keep me up to speed. *sigh*As for the story as a whole, it was pure Maggie Stiefvater magic. Even though the main focus in this book was Ronan, the other characters were still a major part of the story. Gansey, Blue and Adam were ever present, but The Dream Thieves kept Ronan front and center as far as the flow of the story went. And for the record, getting inside Ronan’s head was more than a little scary. Readers just thought they knew Ronan in the first book. Even Ronan didn’t totally understand who he was at the beginning of the story and even though some things were resolved, there is still a lot more to learn and uncover about all the characters.Along with all the seriousness and darkness that was written into The Dream Thieves there was also a fair amount of humor and the characters were as witty and smart as I remember them being in The Raven Boys. That’s a good thing because both the characters and the readers needed a break from all the darkness. Among some of the funniest moments were at Blue’s house. I love that eccentric group. They are full of surprises.There are plenty of glimpses into the established characters and there are some new characters introduced. There were a few mysteries solved and a couple more thrown in… basically, it’s no wonder there wasn’t much back story provided. There wasn’t time! This book was packed full of just about everything, including a pretty intense cliff hanger. Yikes!I can’t really explain why, but I think I liked The Raven Boys more than The Dream Thieves. They’re both very good books and I’m really enjoying the series. I think it all goes back to the time span between the books. Again, it’s not a complaint, just a very helpful warning. 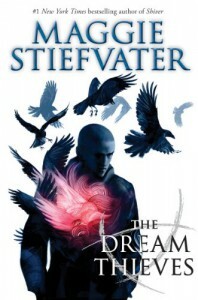 If you are going to pick up The Dream Thieves, which I absolutely recommend that you do, take the time to at least skim over The Raven Boys first. I finished this book and I’m still not really sure how I feel about it. It wasn’t bad, really. It was just, well… hmm.I think that one problem that I had with it is that there was a lot of back and forth. Because of that back and forth, I never really connected with the characters. Both characters were likable. I just couldn’t connect with how they were drawn together since they never really liked or trusted each other. It was corny, kinda sweet and there were parts of it that I did like. I just didn’t love it. *sigh*The only other thing that really stuck out is that even though this book had an historical setting, it never really felt that way to me. There wasn’t anything blaring, or out of context with the time period, it just didn’t have an historical feel to me.Hey, it happens. Sometimes there are books that just don’t grab you. The Rancher Takes a Bride was one of them for me. There were a lot of reviewers that did like the book though and I will probably check out the next book in The Burnett Brides series. It’s still currently a Freebie at Amazon, so you’ve got nothing to lose by checking it out. I received Awakening Foster Kelly in exchange for a fair and honest review. Okay, I have to be totally honest here. When I first looked at the synopsis of this book I was intrigued. It didn’t sound like the average angst/drama filled contemporary YA book that I avoid at all costs. It sounded really interesting and fun. Then I looked at the page count…. 702 pages is A LOT of book. As daunting as that number was, I really wanted to see if the book was as intriguing as the synopsis. Guess what? It was even better. Not only did I not mind that Awakening Foster Kelly was twice as long as most of the books that I’ve read this year, once I got to the end I would have been perfectly content reading more.Foster was an amazing character. She was mature way beyond her years. To say she had low self esteem wouldn’t even come close to describing what she thought of herself. She wasn’t self destructive or self loathing though. In her mind, she was just being totally honest. She didn’t matter in the scheme of things and she was ignored because no one saw her. She was perfectly content with that though. If she didn’t interact with anyone, there was no one to disappoint, including herself. Watching this beautiful young woman blossom was just part of what made Awakening Foster Kelly such a great YA read.The supporting characters in this book were so full of life. Foster’s parents were adoring and as important as their jobs were, their world revolved around Foster. The interactions between them were priceless. They weren’t perfect parents, but that made me love them even more. Foster’s devotion to them was equal to their devotion to her.Foster’s friends were just as interesting – not to mention fun. I don’t know the last time I read a more entertaining banter and interaction between siblings than there was between Jake and Emily. From the time they were introduced I fell in love with them. They were supportive, loving and protective of each other and they shared that love and devotion with Foster.And then there was Dominic. I wasn’t sure how to take him at first. You’ll understand once you read the book. His introduction was not impressive, still, you just knew that there was more to him. Once I got to know him though, I loved him as much as Foster did. It was impossible not to. His story, once it was finally revealed, totally broke my heart. There were a couple of times that I thought I had Dominic figured out, but I wasn’t even close. That was a common theme in this book.I can honestly say that I could never have figured out the way this story eventually unfolded. Beyond being beautifully descriptive and filled with wit, humor, heartbreak and hope, the twists and turns that Awakening Foster Kelly took made my jaw drop. I NEVER saw it coming and once it did I felt like going back and reading chapters and sequences over again to see if I missed a clue. Of course there were some, but still nothing that would have prepared me for where this story ended. There were times that I thought that scenes didn’t make sense or they were disjointed, but once ALL of the secrets were revealed, everything just fit. I applaud Cara Rosalie Olsen for catching me so off guard. 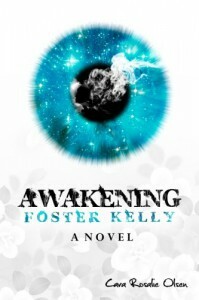 I loved it!Awakening Foster Kelly is so much more than a coming of age novel. It’s a story of finding yourself, accepting who that person is and realizing you’re worth just as much, if not more than the people you ultimately put ahead of yourself. You never see yourself as others see you. That can be both good and bad depending on who you are. There are lessons within these pages for both young and old alike. Foster Kelly came a long way during the course of this book and I really enjoyed taking that journey with her. 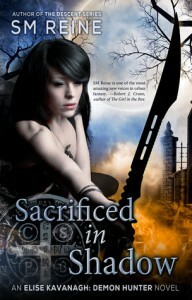 I received Sacrificed in Shadow in exchange for a fair and honest review. I can honestly say that I have no idea where to start. Yes, Sacrificed in Shadow is that kind of book and I think it is already safe to say that Ascension is destined to be that kind of series.First there were the characters. Wow… The supporting characters were just as strong and as important as the main characters. With a cast this size, that was quite a feat, but it was pulled off seamlessly. I wasn’t sure about Lincoln and where he was going to fit. I wasn’t even sure if I liked him or not. There was definitely more to him that I expected. I’ll just leave it at that. I like getting glimpses into the minds of more than one character so I enjoyed the POV switch. To me it keeps things interesting and S.M. Reine’s books are usually full of very interesting characters. Sacrificed in Shadow was definitely no exception.Then there was the world building. There was a lot to build on because this series ties the worlds of two separate series together in some very interesting ways. This is definitely a book that keeps you on your toes. The imagery was amazing and there was just enough familiarity to give readers a frame of reference and go with it.Combine all this with a fair amount of heat (of the smexy variety) some nasty demons, crazy magic, plenty of action and a mystery that keeps you guessing about what’s really going on until the last minute and you have one amazing read. Exactly what you would expect from this author. Things don’t end in a cliff hanger exactly, but you know that there is more in store for all the characters involved. Things hang in the balance for more than one and I can’t wait to see where this series takes this unlikely alliance.In case you don’t know, the Ascension series brings the worlds of Seasons of the Moon and Descent together. I love the way the stories are woven. Although I haven’t finished either of the previous series, I still followed what was happening. The only thing that it did do was spur me to go back and finish both series ASAP. You can probably start with Ascension, but I’d suggest starting at the beginning with Seasons of the Moon. There’s enough back story given to keep you from being confused, but you’re really missing out on a fantastic journey if you don’t.The next book in the Ascension series is Oaths of Blood and it’s already on my TBR list. I read Carniepunk: Parlor Tricks as part of the Carniepunk Anthology which I received in exchange for a fair and honest review. I should have known. I skipped this installment of Carniepunk when I read the book because I knew that I would soon be reading Deadly Sting and (when I'm paying attention) I like to keep my series reads in order. When I added Deadly Sting to my Bout-of-Books list I should have just thrown Parlor Tricks into the mix. Honestly, it was inevitable.A perfect little glimpse into the Elemental Assassin world. 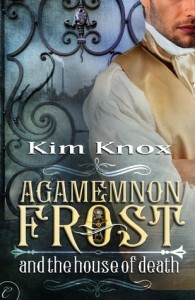 I love Gin and having just her and her baby sister Bria featured in this short read was fun. Well as much fun as a scary, dangerous carnival can be. As per usual, Gin dispenses her own brand of justice with her trusty blades, but this time she has a little help from her sister. There was even enough time in Parlor Tricks for some mouth watering food descriptions. This one was short and sweet but still full of the wit, fun, danger and action that readers have come to expect from the Elemental Assassin series. I have had this one on my Kindle forever… actually since the Elemental Assassin Read-A-Long ended in August. *hangs head in shame* I’m so glad that I added it to my list of Bout-of-Books list for a lot of reasons. Not only was it a sure bet that it would get read, it was also a page turning read that helped me knock another book off my list. Yay!It should come as no surprise to anyone who has seen any of my previous Elemental Assassin reviews, but I loved this book. 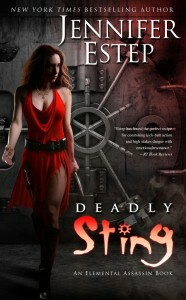 Gin is one of my favorite kick a** heroines and she didn’t disappoint me in Deadly Sting. One of my favorite things about Gin is that even though she is an assassin, her targets aren’t random and she has a strict code that she lives and works by. She is also totally devoted and extremely protective of her ‘family.’ Basically if you mess or threaten one of them, she’s not responsible for what happens – you can pretty much guarantee that whoever poses the threat will be ‘good and dead’ by the end. That may sound rash and extreme, but the world that Jennifer Estep created for Gin pretty much gives its occupants no other choice.My other favorite thing about this series is the characters. The crew that comprise Gin’s extended family are among some of my favorite in UF. I even appreciate the flashbacks because in my opinion readers got cheated out of an amazing character in the beginning of the series. Seeing how much influence Gin’s mentor had on her is an added bonus that I really enjoy.One of the things that I thought was unique about Deadly Sting was that most of the action took place at one place. Gin usually moves around a bit more, but that doesn’t mean that the action was slow or lacking. A lot happened in this one. There were twists, turns a few mysteries solved and a few more opened. A few things were resolved, but not totally… I won’t say anymore, but if you’ve been following the series you probably know what I’m talking about. If not, this would be the perfect time to jump right in. Start with Spider’s Bite and just keep on going. The great part is that the next book in the series, Heart of Venom, releases August 27, 2013. Perfect timing! You can thank me later. I received The Shadow of Mudflap in exchange for a fair and honest review. 4 1/2 Star Review It didn’t surprise me at all that I finished this one in practically one sitting – and not just because it was fairly short. (150-200 pages is not a long book for me.) It’s basically because Christi Snow’s books always demand to be read from start to finish. They tend to grab you from the beginning and don’t let go. The Shadow of Mudflap was definitely not an exception.Mudflap was the first to be introduced and it was an intense introduction. Life or death as a matter of fact. Those opening scenes pretty much set the pace for this book. They also gave readers a pretty good sense of Mudflap’s personality. He was loyal, heroic and he couldn’t accept failure – especially when lives were at stake. Pretty much the personality traits of most first responders.I liked Shanae from the beginning too. She was strong, brave, independent and pulled no punches. She also possessed the perfect combination of intelligence and wit. I understood her reluctance to fall for Mudflap, but from the time they met readers knew it was inevitable. Sparks flew between them from the start and didn’t let up.This was a story full of intrigue, danger, interesting characters, loyalty, humor and plenty of smexy – the usual balance in a Christi Snow read. I loved the twists and turns. (Incidentally, this author has also turned Texas into a very dangerous and interesting place.) It kept the pages turning and left me wanting more. *sigh* About my only complaint with The Shadow of Mudflap is that I have to wait until August of 2014 for the next installment in the Foxtrot Team series. I have no doubt that Mudflap Undercover will be well worth the wait. Okay, not at all what I expected, but not in a bad way. This is one of those books that totally catches you off guard, at least it was for me. In the beginning I wasn’t sure how I felt about the whole relationship. I found myself having the same doubts that Evan had, but once he voiced them, I realized that those doubts were unfounded.The thing is, once I got to know both characters all that initial hesitation went away. 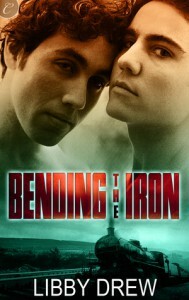 Evan fought his feelings for Jamie to the point that he felt guilty about what he thought he was doing to him – emotionally. Jamie was a wreck over what had happened to him and was expecting Evan to treat him the way everyone else did… like he didn’t matter. The whole scenario was heartbreaking.Beyond all the emotional stuff… and there was a lot of emotional stuff, the personalities of both these characters were priceless. Evan was sure of himself and knew what he wanted. He didn’t hide it, but regardless of what he thought about himself, he didn’t force it either. His ‘cockiness’ was the perfect balance to Jamie’s stubbornness. There was a constant spark between these two and I loved it. They were smart, witty and the banter that bounced between the two of them was hilarious. I’m not sure that Jamie used the same pet name for Evan twice in a row – and none of them were endearing.This was a book of acceptance, enlightenment and coming of age all rolled into one. It was also a perfect balance of romance, heartbreak and fun. It’s not for the squeamish though. There’s a fair amount of violence and some fairly graphic moments, so consider yourself warned. *4 1/2 Stars....For such a short book, this 79 page novella packs quite a punch. 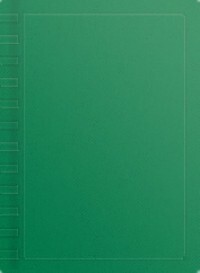 However, from S.M. Reine, that is no surprise.This was just a taste of what’s to come in the Descent series and not a page or a word was wasted. This was more than an introduction, it was impossible to put down. The action was intense, the characters were layered, the world building was amazing and nothing about any of it was sugar coated, which is what I’ve come to expect from S.M. Reine. 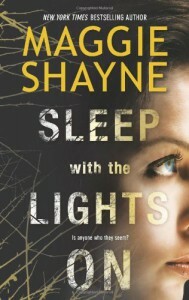 She doesn’t pull any punches with her characters or what she puts them through. I kinda like that Elise and James are definitely characters that I want to get to know better and there’s 7 books in this series that will help me do just that, plus one more novella, Deadly Hearts. 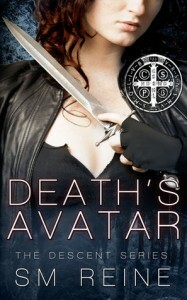 The first full length book in the series is Death’s Hand. Maybe 2 1/2? Brian was beyond arrogant, Samantha was... I'm not sure, exactly what Samantha was. By the end Brian almost made up for the jerk that he was, but not quite. Basically, this one was short... the fact that it continues is interesting. Whether or not I continue with the series to see if either character redeems themselves is debatable. I picked up The Pretend Boyfriend as a free download from Amazon on August 4, 2013. This was one of those books that I started off really liking and then it just lost me. *sigh*A lot happened in Cursed Kiss and the premise was rather unique. The travel between dimensions was an interesting twist. I also liked symbiotic relationship between Luka and Pablo. (You’ll have to read the book to figure that one out.) There was intrigue and danger and plenty of sexual tension, but there was also a lot missing.There was so much I wanted to know and for a while I thought my questions would be answered, but they never really were. I did enjoy what I got out of it though and the unique concept kept my interest, I just wanted more. There are a lot of readers that didn’t seem to have any issues with it though, so don’t let my hesitance sway you. It may have been just me, which happens. Cursed Kiss was an enjoyable read, honest. It just left me wanting to know more about the characters. Not really confusion, just questions. This may be one that I pick up again and see if I still feel the same way.